Claremont, Calif. (March 11, 2016)—Pitzer College student Antonio Godoy ’18 will present recent research findings on the atmospheric impact of a form of carbon sequestration at the American Chemical Society Spring 2016 National Meeting, held in San Diego from March 13-17. For more than a year, Godoy has been working with Professor of Chemistry and Environmental Science Katie Purvis-Roberts and other students from the W.M. Keck Science Department to study the atmospheric effects of gaseous alcohol amines—organic compounds derived from ammonia—that coal-fired power plants use to reduce the amount of CO2 released into the air. This is an attempt at carbon sequestration, which aims to corral carbon dioxide to mitigate the amount of greenhouse gases released by fossil fuels. The team’s research explores how gas-phase alcohol amines interact with atmospheric oxidants to form particulate matter air pollution. Last fall, Godoy presented a poster, “Atmospheric Effects of Alcohol Amines,” outlining the research with fellow students Jackson Dulla ’17 and Tatissa Zunguze (SC ’18) at the W.M. Keck Science Department Summer Research Symposium and, along with Leah Connor (SC ’16), at the Southern California Council for Undergraduate Research Conference at Harvey Mudd College. Godoy, Dulla, Zunguze and Connor are four of the most recent students from across the 5Cs who have worked with Professor Purvis-Roberts on her air pollution research at an atmospheric lab at University of California, Riverside, where she collaborates with a faculty member in the Department of Chemical & Environmental Engineering. 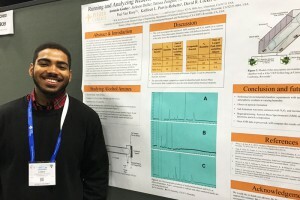 Zunguze and Dana Pierce (SC ’17) will also present at the American Chemical Society (ACS) meeting this weekend. Founded in 1876, the ACS is dedicated to advancing chemistry through peer-reviewed journals, research, conferences, grants and educational research. ACS Publications publishes nearly 50 journals, including the Journal of the American Chemical Society. The national meetings of the ACS draw scientific professionals from around the world, creating a forum to present, discuss and exhibit research discoveries and technologies in chemistry and its related disciplines.